Literally, a taikonaut is a"Man of the great void"", in Chinese. The term is usually used to describe Chinese astronauts. In October 2003, China successfully launched its first manned flight, joining Russia and the United States in the highly exclusive club of countries able to achieve this. The taikonaut Yang Liwei stayed in orbit around the Earth for 21 hours on board the spaceship Shenzhou V. Two years later, China sent two taikonauts on board Shenzhou VI for a five-day voyage in space. 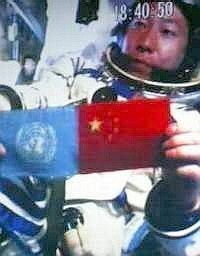 The taikonaut Yang Liwei, the only member of the first manned Chinese flight in history.